Lali Krotoszynski has worked since 1981 in collaboration with photographers, visual artists, musicians and theatre and performance directors in art works that create dynamic interpersonal relationship engaging the body. In 1985 she had begun a long partnership with the performance and theater director Renato Cohen, with whom she has worked in many performances and co-conducted courses and workshops. She has been involved in telecommunication/technology-based art works since 1986 (e.g taking part in such early slow-scan TV networking events as the Sky Art Conference, set up by the Center For Advanced Visual Studies at MIT), and continuing to be regularly involved in workshops and projects in the South America, the US and Europe. With her project Dance Juke Box she has started researching the possibilities of dance in relation to the Internet. Dance Juke Box has been selected to take part in the Monaco Daces Forum 2000. In 2002, she has been awarded the artist residency bursary program offered by UNESCO-ASHBERG and CAiiA-STAR. 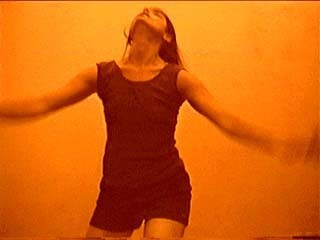 During April, May and June 2002, she developed her interactive dance work ENTRE in Plymouth, England, as part of this program. ENTRE has been developed since then and presented in its progressive stages in different venues in Brazil, the U.S. and Europe. OCUPAÇÃO-2004 (OCCUPANCY) has been shown at the Paço das Artes gallery for contemporary art in São Paulo, in August, 2004 and in FILE- International Festival of Electronic Language, in S. Paulo in November-December, 2004. Bodyweave 1.0 ­ 2004-2005 is the result of an academic research developed for FAPESP (The State of São Paulo Research Foundation) Scientific Initiation program in partnership with NICS (Interdisciplinary Nucleus of Sound Communication) of the UNICAMP, University of Campinas, São Paulo. Bodyweave has recently been selected for the 15 Videobrasil Electronic Arts Festival.